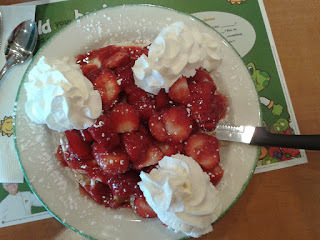 Today my wife and I visited Cora's (10909 Yonge Street, Richmond Hill) for some breakfast food for lunch. We arrived at about 12:30 P.M. to find the place fairly full yet enough staff was serving. We waited a minute for someone to visit us to see how many there were (2 of us please! ), double check to ensure our table was clean, grab menues and seat us. Our cheerful waitress stopped by to see how we were that day and see if we would like to enjoy some drinks while we perused the menues. We ordered are drinks and likety spit we had them back as we continued to decide what we wished to partake in. So many good choices on the menu and not enough stomach space to fit it all. Why couldn't Cora's be on the cruise boat I was on, I would be there everyday for breakfast and lunch sampling their menu. We eventually decided on our order and our waitress returned to copy it down. The Order: 1 Strawberries Waffles (Strawberries heaped on waffles with whipped cream and custard) with a coffee and 1 Western Omelette with home fries, pineapple, melon and toast with a glass of water. Cora's service is outstanding with cheery staff that are not intrusive but do ensure you have everything to enjoy your meal. And the most noticeable thing is the wait staff, cooking staff and others do it with a real smile. Our food showed quickly and attractively presented! The strawberries on the waffles were freshly cut and buried the waffles deeply below. I had to dig the out the waffles from underneath the whipped cream. The waffles themselves were well done as far as I could tell. It was tough though with all those strawberries, custard and whipped cream to isolate the waffle taste by itself. My wife said the Omelette was ok, but her home fries were awesome. Fresh potato wedges that were decently cooked and served. Everything appeared to be freshly made on her plate. Our waitress returned once to refill my coffee and my wife's water. She was fairly attentive during our meal. We left feeling very full of fresh food ready to continue on with our Saturday shopping errands. Overall this place is great for freshly made breakfast food with an emphasis on old favourite breakfast items made with fresh ingredients and a flair of fresh fruit.